Valentine’s Day is only 2 days away and as I’ve mentioned before, it’s one of my favorite holidays, because it’s an excuse to get dressed up with your love. 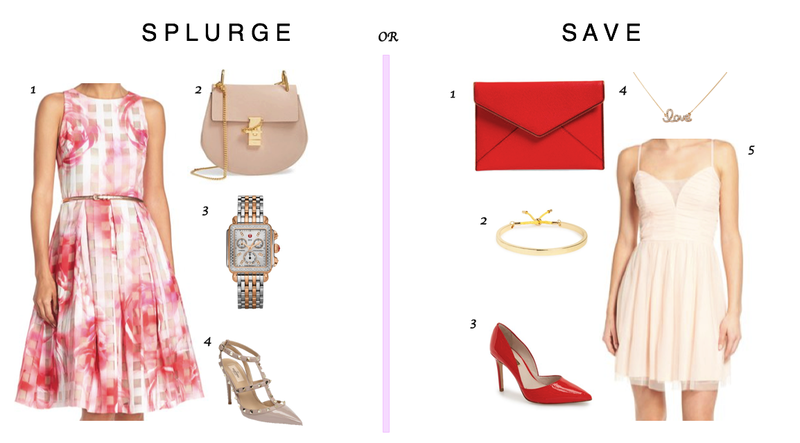 If you are still trying to figure out what you plan to wear for your date night with your special someone, I’ve picked out two fun outfits that you can either splurge or save on. Splurge Outfit | I saw this floral dress in Nordy’s catalog and I’ve been eyeing it ever since. It’s an absolutely perfect dress to celebrate Valentine’s day in. I love the texture, the pattern, and the back. You definitely gotta check out the back! In case you didn’t know, I am a sucker for shoes, handbags, and accessories. Sorry Chuck! (poor hubby). And I’m talking expensive shoes, handbags, and accessories. First, can we talk about this gorgeous, blush pink Chloe handbag. I’m dying! I absolutely love it. It’s the perfect blush color, is a perfect accessory year round, and matches my favorite Valentino heels I’m showcasing as well. To top this outfit off, we have to add a statement piece of jewelry. My favorite piece to add to a feminine outfit is a gorgeous Michele watch like this one. The glitz, glam, and size adds a bold element to this sweet, soft look. Add a few bangle bracelets and your set. Head to Nordstrom if you want this outfit for your weekend! Save Outfit | Now, let’s be real. Who can afford to buy a Chloe handbag, Valentino heels, and a Michele watch all at once. Well…not me! (I wish!) However, we can put together a rich look on a budget. This baby doll dress is only $58 and is adorable. It’s the perfect blush color for Valentine’s day and can be paired with a simple, winter white blazer or shawl when it get’s chilly at night. Pair it with delicate jewelry like this $15 bangle bracelet and $18 ‘love’ necklace that fits the look of this dress perfectly. Lastly, I added less expensive shoes and a handbag to pop some red into this soft, blush dress. This red Rebecca Minkoff clutch is under $100 and can be worn year-round. Same with these patent red heels. They are the perfect red, match this clutch, and can be paired together at Christmas time too. Double duty! Head to Nordstrom and T & J Designs for this look. As we head into the weekend, I hope you all have a great Valentine’s day with your hubby, boyfriend, girlfriends, or someone new.